Hey there everyone, we're back on the blog with another character from the Faithful box for you to get your mits on. If you missed last week's look at Veteran Chisel, you can check it out here. This week, though, we're going to be looking at a much sadder tale. Times change. Allegiances shift. People adapt. These things are as true in Guild Ball as they are in real life, and the character we're examining today has had quite the change of heart. Once an alcoholic, drowning in misery (and whisky), Spigot found the light of the lord Solthecius and got off the drink, becoming a star footballer. However, the Brewer's Guild, with a complete lack of understanding of the very real problems of alcoholism, don't take too kindly to a player who doesn't drink. As to exactly how Spigot was ousted from the Brewer's Guild, well, you'll need to ask Sherwin for that story. Today, we're going to look at where this character's rules have ended up. So Seasoned Spigot presented an interesting challenge for us. Designing a second or third incarnation of a Guild Ball character is always something special, and this time had an added element of trial since the player in question was changing Guilds. We needed to maintain the feel of Spigot while also acknowledging he's moved into a new phase in his life, and do all that while looking at the role we want him to play within the Order. With that said, let's start getting into his stats. Spigot has a very similar statline to his Veteran version. In fact, everything is identical barring the addition of a point of ARM. The Order models we've seen tend towards having ornate armour on them, and so we wanted to reflect Spigot's change of allegiance physically on the model too. This gives him a defensive statline of DEF 3+ ARM 2, which is very respectable. The other stat it's really worth calling out is his KICK stat. At 4/8", it's at the absolute top end of KICK stats in the game, only matched by a handful of other models. Spigot's playbook is very varied, with pretty much everything you could want on there. A Tackle on column 1 and a double Guild Ball result on column 2 to trigger Ball's Gone mean he's an absolute devil to keep the ball away from. And once he gets it, with that 4/8" KICK it's going wherever he wants it. He also has a non-momentous knockdown on column 3. That playbook result actually caused a fair bit of debate, since Brewers generally have momentous knockdowns, but the Order don't have particularly great access to knockdowns. This result presented a compromise that captured the flavour of both Guilds. Momentously, Spigot has a Dodge on column 2, a two DMG result on column 3, a Tackle Push/Dodge result on column 4, and three DMG on column 5. This gives him quite a lot of options, allowing him to move around, snag the ball off enemy players, and actually inflict a fair bit of momentous damage if he needs to. Particularly, that momentous Tackle Push/Dodge is a gorgeous result if you can get it, although you will often need to Charge to access it. Moving on to Spigot's Character Plays, we've already said, he has Ball's Gone, just like his two predecessors. Ball’s Gone adds to Spigot’s arsenal to let him very easily get the ball from an enemy model and punt it away. This Character Play is also useful for getting around Close Control if the opposing team are trying to make your life difficult. 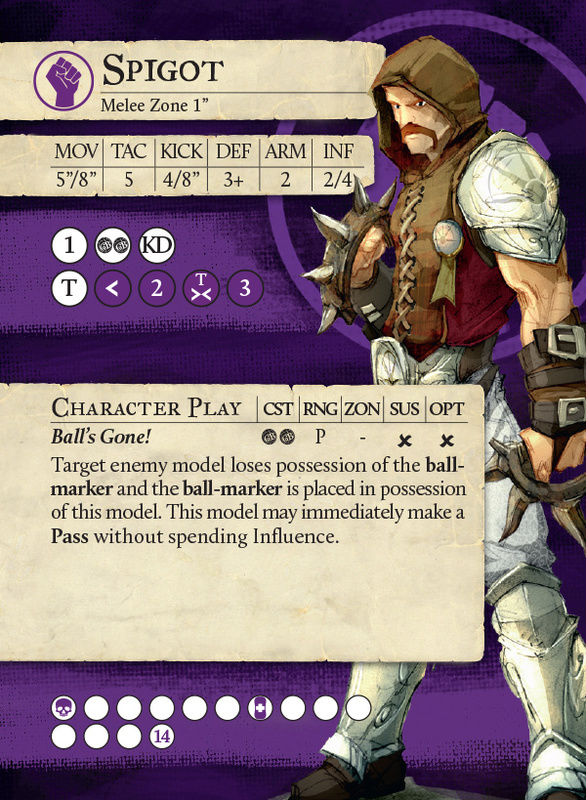 The Order are very focused on playing with the ball, and Spigot is a key part of their toolkit in terms of getting the ball back from the enemy team if they're trying to keep it away. Well speak of the devil, talking about Close Control, there it is! Spigot is also a key part of the Order team in terms of holding the ball if they need to. This also lets him Tackle the ball from an enemy player and keep it safe from any Counter Attacks that might be coming his way. Since Spigot's Veteran version has Close Control, it felt very natural for him to keep this rule both as a link to his previous version and to help him fulfill his role within the Order. Spigot has always been a spectacular footballer, and his ball control skills have only gotten better with time. The second Trait on this card is Floored, one which is borrowed from his first incarnation. Again, looking back at Spigot's previous versions provided us with some inspiration here. While, as we've said, the Order doesn't have particularly good access to knockdown, they do have some (Veteran Fangtooth looks like a big beefy boy huh?) and Floored helps Spigot put the hurt out on any enemy player fool enough to get knocked down nearby. Since he has a knockdown on his Playbook, he can also set himself up if he hits that result early when he's attacking someone. The final rule on the back of Spigot's card will look a bit familiar. One of the coolest things about Veteran Spigot is his Heroic allowing him to make a free Kick without spending Influence, and we wanted to keep that for his latest form (THIS ISN'T EVEN MY FINAL FORM!). However, we didn't want to keep the whole Heroic, and a free Kick as a Heroic by itself is a bit lacklustre. So we took inspiration from the Character Play, On My Mark, to create Reading the Game. Spigot can use this rule to make a Kick himself without spending Influence, OR much more wackily, allow another friendly model to immediately make a Kick without spending Influence. This opens up a whole mess of possibilities for old Spigsy Wigsy and the Ordery Wardery. Spigot can basically be a pinball wizard, booting the ball around all over the place and allowing his team to pull off some real jank. Eagle eyed readers (or those who can count numbers) will notice that Season Spigot has two rules from each of his previous versions, and yet he's a very distinct and unique model. We're extremely happy with how much Spigot feels like himself, and yet also an Order model. He's a playmaker, he can score goals himself, but he's best used supporting his team and getting the plays underway. It's worth reminding everyone right now that Seasoned Spigot is a Union model until Season 4, when he will split off and become solely an Order model, so he can be used within the Union for the time being. We're big fans of Seasoned Spigot (especially Sherwin, he LOOOOOVES the Order), and we're confident he's gonna win a place in your hearts too. Let us know what you think on our forums and our social media, and if you think Seasoned Spigot looks like a holy terror, you can pre-order the Faithful box here. Next week we're gonna be looking at Spigot's new brother in arms, the biggest baddest boy himself, Veteran Fangtooth! Happy trails, catch you soon!